Las Choyas geodes, often referred to as coconut geodes are mined from 100 to 200 feet below the surface near Chihuahua, Mexico. 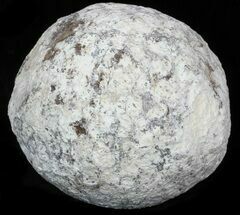 The geodes typically range from about 2-6 inches in diameter and can contain a variety of minerals and crystals. Most hollow geodes contain a variety of quartz ranging from clear quartz to smoky quartz to more rarely amethyst. Many secondary minerals such a goethite, hematite, mordenite, calcite and galena may also be present in some geodes. Whole/Unbroken Las Choyas Geodes - 3" to 3 1/2"